The Chancellor announced at the recent Budget two new schemes designed to support home loans where home buyers are struggling to raise a large deposit. The Help to Buy scheme will provide up to 20% of the value of the property (new build houses only) by a shared equity loan . You have to provide at least a 5% deposit so this means that you could buy a property with just a 75% mortgage from a bank or building society. The equity loan can be repaid at any time or when you sell the house but if the house value increases so does the amount of the loan that you will have to repay. The loan will be interest free for the first 5 years but after that there will be an annual fee of 1.75 % payable which increases every year by 1% above the Retail Prices Index. This is an extension of the existing First Buy scheme and now applies to all buyers of newly built homes not just first time buyers. You can apply from 1/4/13 and the scheme runs for three years. The second scheme is a Mortgage Guarantee scheme which will be available for three years from January 2014. This will apply to new and old houses (the previous Newbuy scheme only applied to new houses) and not just to first time buyers. 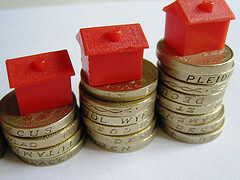 You will have to provide at least 5% deposit and the government will be guaranteeing up to 15% of the house price. This is intended to encourage lenders to offer loans of up to 95% , secure in the knowledge that the government guarantee minimises any risk. The details of this scheme however are still awaited. The maximum house price for both schemes is £600,000. Stamp Duty: up until 5 April 2013 if you bought a house in certain areas which the government had designated “disadvantaged “ (there were three such areas in Ipswich) you could pay up to £150,000 before having to be stamp duty. Although it wasn’t mentioned in the Budget, the Disadvantaged Area Relief was abolished on the 6 April 2013 so stamp duty is now payable on all properties over £125,000.